[End of notice] Therefore, real Jerusalem is in the land of Punt. Real Jerusalem is the place where King Solomon built the First Temple. All indications point to places other than to Aelia (present-day Jerusalem). The real Jerusalem could be in Bethlehem (also called the city of David as present-day Jerusalem!) or Gerizim Mount in Nablus. The Second Temple was most probably built in a site totally different from the site of Solomon’s Temple (Beit HaMikdash, means the holy house or temple) for political reasons. 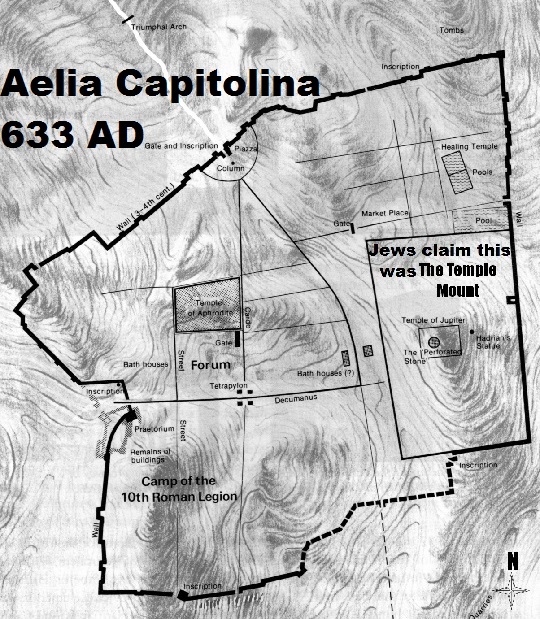 Surely, both sites were not in Aelia (present-day Jerusalem). 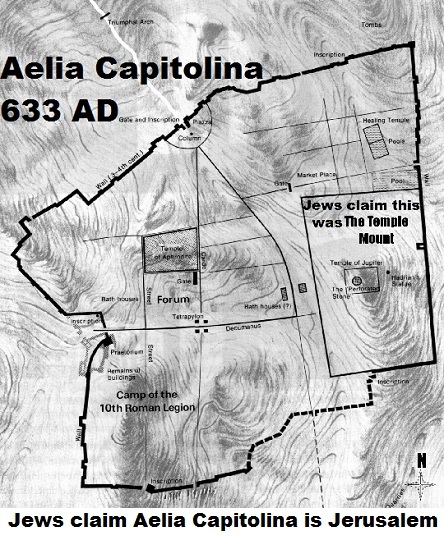 Aelia or present-day Jerusalem is a holy city mainly for Christians, and to a lesser extent for Muslims; but it is not holy at all for Israelite and certainly not for the Turkic Jews. The world must investigate and question the name “Jerusalem” before handing over the most holy city for Christians to the Jews. Until this is done the world must reject giving the name “Jerusalem” wrongly to Aelia. The Romans were NOT too mean or too stupid to build their Jupiter Temple on top of Solomon’s Temple. The Hebrew Bible, which says that the city of Bethlehem was built up as a fortified city by Rehoboam, identifies it as the city David was from and where he was crowned as the king of Israel. 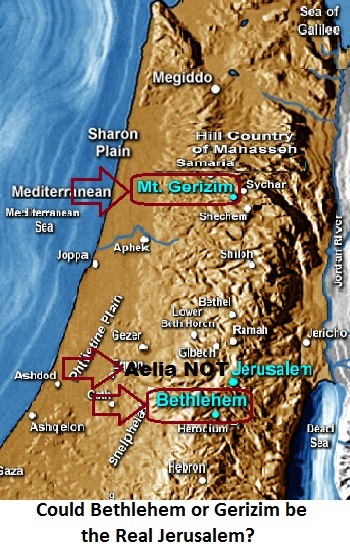 The New Testament identifies Bethlehem as the birthplace of Jesus. This brings back the essential question: Why Bethlehem and present-day Jerusalem are both called “the city of David”? There are archaeological discoveries around Bethlehem that intrigue scholars and relate them to the First Temple despite attempts to hush it up. The Samaritans (Samaritan Hebrew: Shamerim ), meaning “Guardians/Keepers/Watchers” (of the Torah), Hebrew: Shomronim, Arabic: al-Sāmiriyyūn) are an ethnoreligious group originating from the Hebrew Israelites of ancient time. They have their own Torah, language, history, and Jerusalem. They insist that the Jews are not Israelite or believers; and they are foreigners who displaced the Israelite after the Babylonian Return on 530 BC organized by the Persians. According to many scholars, archaeological excavations at Mount Gerizim indicate that a temple existed in the first half of the 5th century BC. The history of schism between Samaritans and Jews is known, and by the early 4th century BC the communities have had distinctive practices and communal separation. According to Samaritans, it was on Mount Gerizim that Abraham was commanded by God to offer Isaac, his son, as a sacrifice (Genesis 22:2).